Election Day, if not done already then do it today! After some nerve-wracking moments of trail laying, like having men pressure washing the path on which you intend to drop flour working until nearly 6:00pm, fifteen(?) hounds made it to the smoky end, Mr C’s. Though a touch chilly the weather allowed us to sit outside. 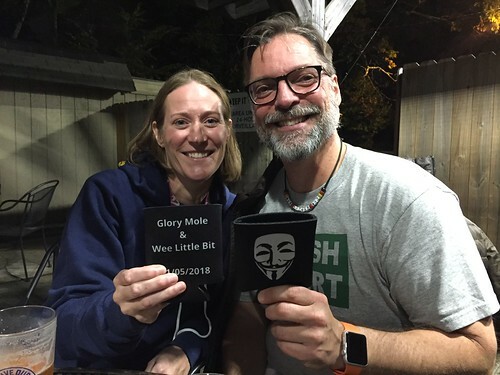 Those who made it to the end got to spend time with these two fantastic hares, and scored a one-time-only giveaway to commemorate Glory Mole’s first haring. The image on the koozie is that of “Anonymous” and is associated with Guy Fawkes Day. Tuesday Tale of the Tape: 209.0 pounds (-0.8 pounds from last week’s weigh-in). You had swag?!?! Wow. Impressed! I’ll vote after work. Maybe the crowds will be down at that hour. It’s good to see all the early voting and hopefully today’s turnout will keep this going. Reading the owners manual of the “new” bike last night. All coming back to me, just slowly. Now let’s see if I can translate it to action on the bike. Quality time spent on the trainer… HRM seems to be eating batteries. I disconnected it completely from the chest strap to see if it was shorted out somehow. We’ll see. still waiting for a picture Steve………. Sorry. By the time I got home and got changed, it was pretty much dark. I’ll try again this evening. Hopefully it won’t be raining. Nice swag. Congrats Bonnie! And too funny on the pressure-washing, you just can’t make that stuff up. Glad the trail went well- weren’t there power poles or trees for the flour where they were pressure washing? Massages were awesome…….. of course. Oh yeah, Eagle was about four miles with train tracks and three checks; Chicken was about three miles and cut out the train tracks and one check. 14 ran trail and two came to start/end. It was both fun and nerves, and I learned a lot! Many thanks again to my awesome co-hare :). 135 lbs. today—no weight loss. Not surprised after my behavior the past week, and I haven’t started the month being a good influence on my friend Paulie 🙄. Though he did manage to lose weight 🙂 🤜🏻🤛🏻. And only one seemed to get lost! Listened to some constructive criticism for the next time I can boonswaggle Glory Mole into laying another trail together. Um, I think you mean hornswoggle, instead of boonswaggle. I only ordered twenty koozies, two of which were earmarked for Bonnie and me, so I was getting nervous at the start. Of course I could order more but really didn’t want to do so. I may have just feasted on a veggie burger and french fries. Because it’s so cold in the office I may be overly-enjoyed to have shoved those hot fries into my mouth. In other news, what are we going to do with The Gulch now that Amazon HQ2 is moving to two cities, neither of which is Atlanta? For the record I did not want Amazon to move here, but know many people with real estate speculations did. If they don’t keep the Gulch in mind as a multi-modal terminal, they are foolish. I just barely remember the Union Station, which I think was demo’d in 1970, in case you were wondering why there was a gulch. I’m totally out of the loop – where is Amazon going? Supposedly Virginia (near DC) and New York (Long Island City). That’s the rumor from the WSJ. Don’t believe it until they announce. More speculators trying to make money. Since the office is so quiet (Election Day) and the weather now so pretty, I just finished up a little more than two-mile stroll around midtown. Huzzah!